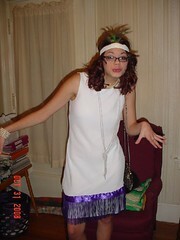 Halloween night found Kelsie dressed to the nines as a beautiful flapper. Although the kids are a bit too big for trick or treating they still like to dress up. This year there was a party at a friends house and all the girls dressed in 20's clothing. The outfit was put together by Kelsie and I and the coat was compliaments of my grandmother - Nana Dot. Kelsie was quite the bees knees. This past weekend was Christmas in July at camp. We had a blast (or at least I did). We got out the reindeer that we bought last year at AC Moore, put up a christmas tree that I had a few years ago with the cats were kittens, decorated the pine tree in the front of our site with paper snow flakes, lights and purple crinkle paper. OF course it rained buckets immediately after I finished so the PAPER decorations got a little soggy but it was fun to do. Later that night, Santa came to the campground in a golf cart of course to see all the kids and give them presents. We had punch and cookies and some of the adults stayed and sang karoke. It was a lot of fun inspite of the rain. Carolyn.... by cat vote, Carolyn is the winner of the Christmas contest. As you can see we did it very fairly, the siamese cat Sasha, is Cheryl's and the fluff ball is Doug, Jared's cat. Carolyn, if you contact me we can decide if you want yarn that I have already dyed or if you want me to dye you some special. You decide. After the excitement of the contest, we settled down to the business of Christmas. I was very busy making soap bags, and face cloths for Mary's mother, sisters and sisters-in-law as Christmas gifts. Julie helped me make some soap and let me buy some of her other soaps that she had made previously. So that was their gifts. I also made the Celtic Braid Socks for my mother-in-law Fran with yarn that Kelsie and I dyed this summer with the wild raspberries and some purple dye. So we were set. Or so we thought. On Monday afternoon, my mom went to a doctor's appointment where they did an EKG. It was abnormal. So they sent her to the hospital, where they kept her. Seems that she had had at least one heart attack if not more. So into the hospital she went, and stayed. She was there Christmas, and Wednesday at Holy Family hospital and then she was transferred into St. Elizabeths where they put a stent into her right cardiac artery. Now she is home and feeling much better. But with that and everyone at our house being sick it has been an interesting week. I am currently working on a chemo cap for a woman that I work with that is battling breast cancer for a 2nd time. I will post pictures when it is more done. For Christmas I received my very own sock blockers YAH!!!. 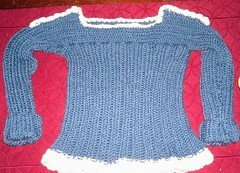 I will post pictures of them and the yarn that went with them next post. Have a great NEW YEAR! Do you put up a Christmas tree? If not then what do you do? We put up a fake one now, but for a while we used a real one (before cats) and I loved it. When do you start your Christmas? 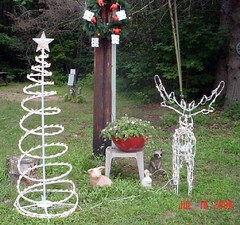 I start shopping in July but no decorating until very near. Do you send Christmas cards? No, always intend to and never get around to it. Do you make them or buy them?